See this Malwa 560H in our second article and video about commercial thinning with small CTL-machines. This harvester operate in a small thinning crew where a Malwa 560F forwarder is doing the haulage. First article and video showed a Terri 34C harvester in second thinning and you can find it here. 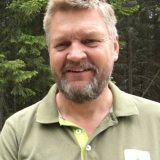 Magnus Wallin, the founder and owner of Malwa, firmly assert that this size of machines can be used also for the second (commercial) thinning. I asked him to show me a Malwa in a tough stand to prove it and after a while he called me back and asked me to come. The stand and the thinning that I filmed was located in the province of Halland in south Sweden. This was a really “juice” spruce stand where you almost could hear the trees grow. 40 year old spruce (Picea Abies) at a very good soil on a former agriculture land where the largest trees already were over 22 meters high (72 ft). And with a standing volume of more than 500 cubic meters/hectare! This stand had been thinned once for 10 years ago. You could see old stumps but you couldn’t see any trace or track from machines. Magnus thought it must have been used an ATV or a very small tractor. Or maybe a winch processor to get the wood out of the stand. There were still a lot of stems growing and it’s a very dense stand with appr 1500 trees/hectare (600/acre). Despite the height and the density, there was no “self thinning” yet by dying, tiny trees, and the major stems had good dimensions. A very productive stand! Now, it was thinned for the second (and last) time with the Malwa 560H harvester. The harvest was less than 20% of the standing volume and the thinning was a typical “low thinning” meaning that only he smallest stems was removed. Average trunk size in this thinning was appr 0,14 cubic meters (solid under bark) per stem. That’s 140 liters/stem (5 cubic ft) and three times as much as it usually is in a first thinning. Even if it was a weak thinning a lot of wood hit the ground. Somewhere like 80 cubic meters of pulpwood and small sawlogs per hectare (like 30 tons/acre). After the thinning, the stand had a good density and there was only 3 meter (10 ft) wide roads from the machines. 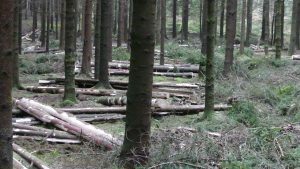 This will be a great stand with lot’s of nice wood to harvest in a final felling within 15-20 years. Malwa’s thinning concept means (as like Terri’s) that the forwarder drive at all roads where the harvester has been. The harvester doesn’t use any ghost trail system with secondary tracks between the forwarder roads/strip roads. With a crane reach of 6,5 meter, it will be some 12-14 meters (cc) distance between the roads. The 560H harvester is 1,95 meters wide (6 ft 6 in) with 500-tyres and the 560F forwarder is 2,15 meters (7 ft 2) wide with 600-tyres. 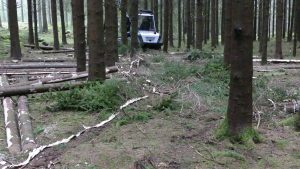 The “road” cut to get space for the harvester is less than 3 meters (10 ft) wide and this corresponds with the average distance between the trees after this final thinning. There are left appr 1000 stems/hectare (400 st/acre). the Malwa harvester 560H is only 195 cm vide (6ft 6 in) and can operate in road space less than 3 meters (10ft) width. This method also means that all slash from the logging ends up in the roads. 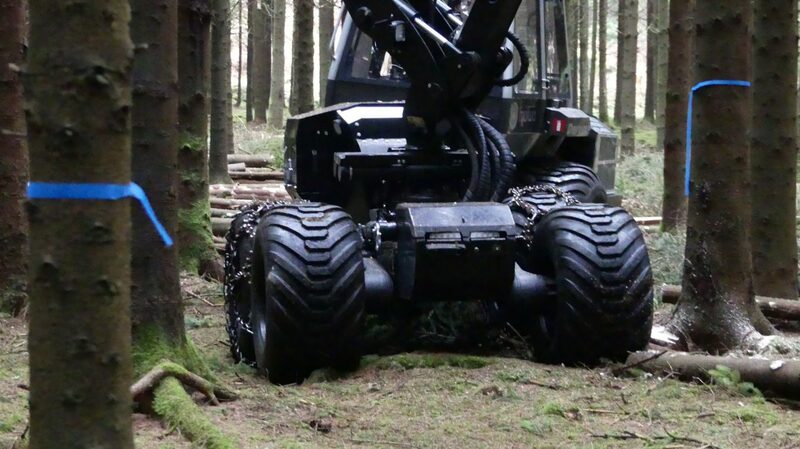 The operator tries to place tree tops beside the road trees, align in the road direction, to protect trees from the wheels of the forwarder. purposely all tree tops against road side trees and roots to protect them from the forwarder wheels. Is the Malwa 560H able to handle a second thinning? Yes! In a thinning like this, only focused on the smallest stems, the small Malwa 560H harvester has no problems to handle the trees. The crane can lift and the head can fell, delimb and cut without any problems. Even if any of the largest trees must be taken down it will be done without problems. 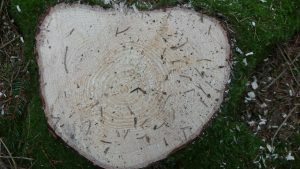 Max felling diameter is 42 cm (6 1/2 in). 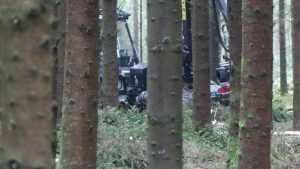 One thing I could notice though, was that the harvester had to work with some of the trees before he got them down on the ground. The high density and rather tall trees despite a small diameter made some of them stick between larger trees. 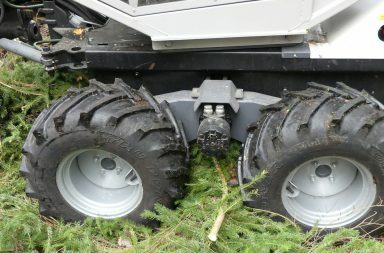 A bigger harvester might have had a better “momentum” with more strength and better crane reach to drag trees down quicker. But it wasn’t a big problem as all trees hit the ground sooner or later. Unfortunately, I hadn’t enough video to log the production pace. But it looked pretty much as the Terri in the article “Commercial thinning with small harvester Terri 34C 8wd”. The head (LogMax 928) and the crane (Mowi P40) are the same and capacity is rater similar so we can expect a cutting pace of some 90 trees per hour. So, sure it’s possible to use small machines even in the second thinning! Malwa 560H has a Mowi P40 crane with 6,5 meters (21 ft 4 in) reach. It’s equipped with a LogMax 928 head. The average trunk in this part of the thinning site was 0,14 cubic meters/stem which gives a high production per hour. The average for the total site was 0,091 cubic meters/stem (91 liters ≈ 3 cubic ft/stem). I got some more information from the contractor after he finished the site. He did the work at hour rate but he had calculated the production cost per cubic meter based on the total time used and volume harvested. 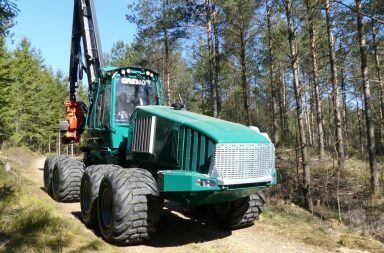 The result was a cost of SEK 235/cubik meter (US$ 22/ton) including hauling to roadside with the forwarder. I don’t know how much the forest owner was paid for the wood but I estimate SEK 500/cubik meter (US$ 47/ton) for this mix of pulpwood and small sawlogs. The most obvious difference in cost between traditional strip road thinning CTL-machines and smaller, in-stand operating CTL-machines is the hauling cost. The small Malwa 560F forwarder only takes half the load of a Rottne F10 or Gremo 1050F thinning forwarder. Even if the hour cost and fuel consumption is a little bit lower for the Malwa, the hauling cost will be some SEK 20-40 per cubic meter higher (2-4 US$/ton). If the hauling distance is reasonable short. In stands with small dimensions, the production capacity for the Malwa 560H harvester is rather well in balance with the hauling capacity of the 560F forwarder. But if the average trunk size increase to over 0,1 cubic meter/stem (3,5 cubic ft/stem) the harvesters production capacity will probably be significant higher than the forwarder’s. 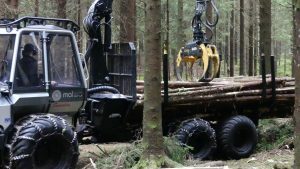 Despite the higher logging cost, there are many forest owners that prefer to have those smaller machines to thin their young stands. 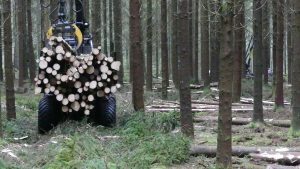 According to Magnus Wallin from Malwa, more and more wood purchasing companies offer thinning with small machines in southern Sweden. -The small machines help both contractors and wood buyers to get more assignments. 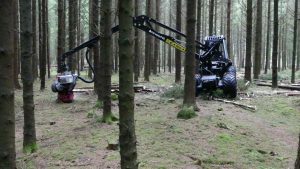 When the neighbor forest owners sees the result from our thinnings, they want our machines to do their thinnings too, says contractor Petter Marklid who run this Malwa crew we visited. 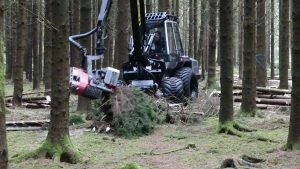 Here is another article and video about a Malwa 560F forwarder in a thinning crew together with a Rottne H8 harvester. All slash ends up in the road and it gives a good bedding. 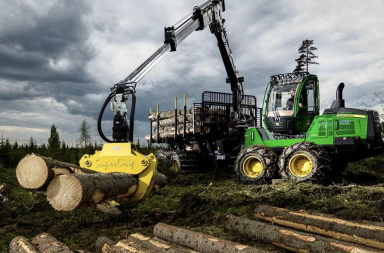 Carrying the forwarder also on soft ground conditions.